The SSMA is the most economical of the automatic cyclic pumps. Because of its compactness, it allows automatic centralized lubrication where space is at a premuim. This makes it especially well suited to small machines which previously required manual lubricating. The clear plastic reservoir allows easy viewing of the lubricant level. A three holed bracket is provided for convenient mounting. A self-closing lid makes refilling simple. An optional float switch is available. 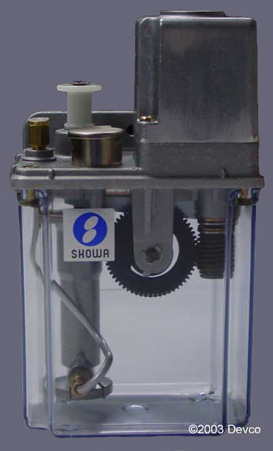 If you require a more Heavy-Duty pump take a look at the Showa SMA, Showa SMD, or the Showa YMAS.